A new living room on the dunes of Virginia was designed with large and small gatherings in mind. An ellipse of 4” thick white concrete is a solid anchor for the family, resting on three pillars rising out of the sand. The pillars are off-­‐set from the center and are formed so that they rise askew, providing maximum structure, ample knee room and a fun, disorienting visual moment. The finished decking hovers above the dunes and directly connects the main house to the beach beyond. 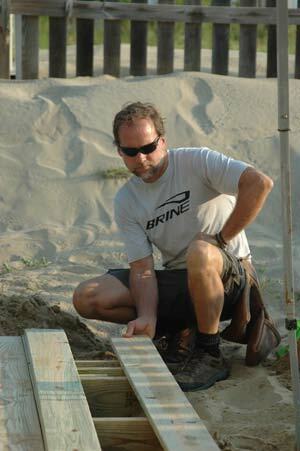 The Sandbridge project was a great start for Patrick Schoonover – our new lead fabricator in the fine concrete studio. The road trip and three days at the beach was anything but conventional. Patrick started day one with digging a very large hole; the concrete pillars that are the three supports to the table can withstand hurricane winds and waves, so they have most of their mass underground. The polished white concrete includes shells from the ocean, but is a refined surface with a high degree of finish. 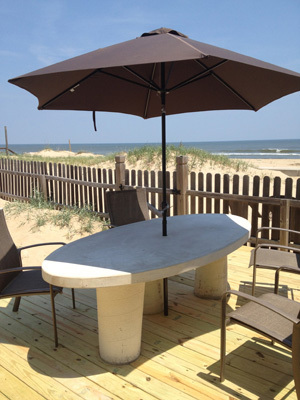 The table is sized so it is intimate for two, but can accommodate the extended family that gathers during the summer. We finished off the week with a load of steamed crabs and a night of karoke, a truly memorable time in the life of the studio. Luckily, no pictures from karoke night…..